Rug blocking and stretching is the process of reshaping a rug by professional means. Rugs can wrinkle or warp due to normal use, poor cleaning techniques, pulling, and tearing. Professional rug stretching involves large industrial equipment and a whole lot of patience! Placing heavy objects on a rug wrinkle won’t get rid of it! Only a professional rug care team like Smart Choice can straighten and flatten an area rug to make it look like new again. We can think of several reasons why you’d want to have your wrinkled rug fixed. The most obvious benefit of rug blocking is that it restores the appearance of your rug. A rug with curled corners and wrinkles across the middle isn’t nearly as attractive as one that lies flat. Safety is another concern with wrinkled rugs. A rug that doesn’t lie completely flat on the floor is a tripping hazard that you can easily eliminate! Finally, wrinkles in a rug can damage it because certain parts of the rug will receive more friction due to foot traffic and furniture moving across the folded parts. 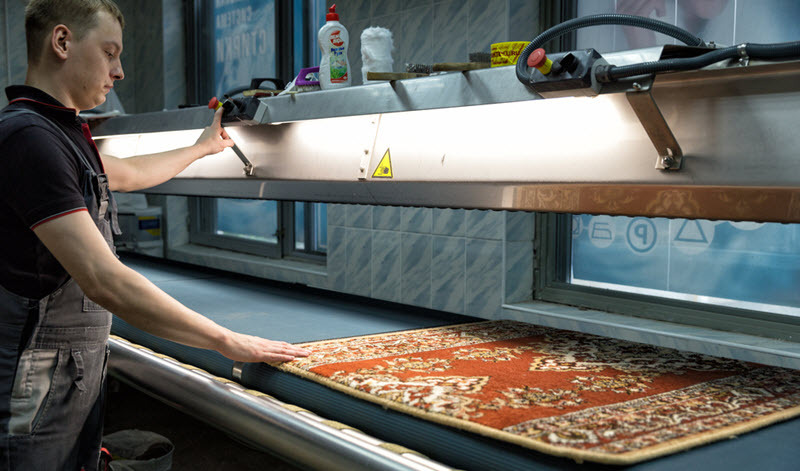 We have the most advanced equipment for rug stretching, and our team members know exactly how to use it to restore your rug’s shape without damaging its structure. Smart Choice is one of the only rug care companies in the area to use such precise techniques to repair a wrinkled rug. It may be more time consuming to do it our way, but it’s definitely worth it! Call Smart Choice for rug blocking when the value of your rug MUST be maintained! Rug blocking and stretching is easy if you have the right tools. 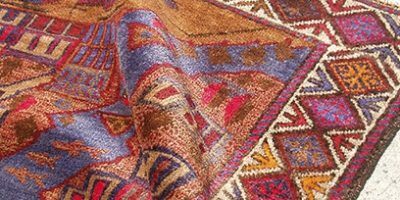 Smart Choice makes repairing and reshaping rugs look easy, but it takes a great deal of knowledge about rug making to do rug blocking correctly. Brush the pile by hand until it is smooth. This step helps us to adequately identify where the wrinkles are. Roll the rug tightly from the side where it is not wrinkled. As we do this, the rug will naturally straighten out some of the misalignment issues on its own, meaning that we won’t have to pull and stretch it quite so much. Unroll it and stretch it out on commercial equipment specifically designed for this purpose. Our rug blocking machine has small wheels that can be rolled in any direction to pull wrinkles straight with tension just a little bit at a time. Moving along the grain of the rug’s pile, we use a special iron to flatten it. We can also apply starch to the back of the rug so that it will retain its shape. These steps should never be copied at home! Only our industrial equipment can adequately repair a wrinkled rug. In some cases, the corners must be flattened with weights if they roll after ironing. After this process is complete, we can add rubber strips to the backing of the rug to keep the edges from curling up. Smart Choice doesn’t use tactics like nailing or gluing that can further damage the rug. Companies that do these things obviously aren’t concerned about the structural integrity of your rug or about its longevity beyond their services.